The last time a Pope, the supreme head of the Roman Catholic Church, left office without dying first was 1415. The situation then was very different from today -- at least institutionally. The Catholic Church of the late medieval era was in the midst of what is known as the Great Schism. Politics had gotten control of the Church, and as a result the Church found itself with two Popes. One Pope was headquartered in Rome, the other in Avignon in France. 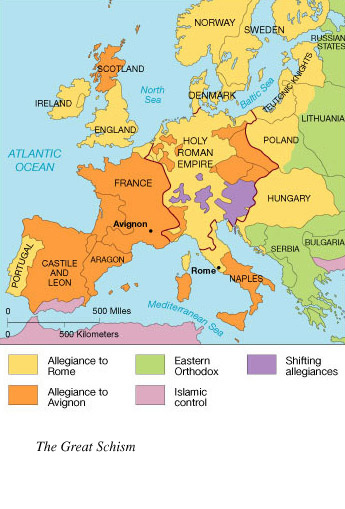 The nations of Western Europe that formed the Roman Church had chosen up sides, largely along political lines. Some, like England, backed the Roman claimant, while France backed its own Pope in Avignon. In 1409, the Cardinals, weary of this situation gathered at Pisa and appointed 15, the Council chose to depose the two rival Popes, and elected Alexander V as the proper successor to the throne of Peter, and when he died he was replaced with John XXIII (the first John XXIII). Of course the two other Popes refused to budge, leaving the church with three Popes. So, what to do? Everyone made their own claim to authority, had their backers, and the church continued to divide. This was, remember, a century prior to the Reformation. They deposed all of the claimants, and chose a new Pope, one who would continue the Roman line, which is why we have two John XXIIIs. It should be noted that it was at Constance that John Huss was condemned for heresy, which in many ways set in motion the movement toward the Reformation in the 16th Century. The schism began to heal with the appointment of Martin V. The desire to put Councils at the head of the Church failed to be achieved, and the Church would soon enough face greater challenges, as the Western Church would divide in new and different ways, but for a time, it quieted the voices that were pushing the Church apart. But for a Pope to actually resign -- well that goes back further in time. It was 1294, and the Franciscan Celestine V, chose to abdicate after two years in office. It is said that he chose to do so in true Franciscan style, appearing before the Cardinals, he shed his papal robes and sat on the ground, humbly declaring he would not change his mind. Interestingly this humble Franciscan was succeeded by Boniface VIII (1294-1303), who issued the famed Papal Bull Unam Sanctum, which declared that since all temporal power belonged to God, that all humanity should submit themselves to the authority of the Pope. I share all of this as preface to comments on the announcement this morning on the part of Benedict XVI to resign (retire?) as Pope on February 25. Popes just don't resign. They die in office, as Pope John Paul II. But perhaps John Paul's long and agonizing death, which enfeebled the Church, sat in Benedict's mind. At 85, he recognized he didn't have the strength to manage the sprawling bureaucracy and deal with the manifold issues that face the church as it expands around the world. As an ecumenically minded, progressive, Protestant pastor, I've not been a big fan of Benedict. I've felt he was dragging the church well to the right, undermining the reforms of Vatican II. Of course, I share this feeling with many Catholics, especially in the United States. Still, this is a rather dramatic step, which could set precedent. Future Popes could make the same decision, choosing retirement rather than fade away, putting the church at risk. Personally, I think this step should be commended. But what is next? Where will the church go? Many are suggesting that the Cardinals will look to the South and the East, where the Church is growing. Benedict's desire to reinvigorate the European Church seems to have fallen to side. The forces of history simply overwhelming his desire to retrench. But, will the Church go that direction. We've had two non-Italian Popes, will the Cardinals go back to Italy one last time? Or will they make the bold move? And will the next Pope continue taking the church rightward, or will he (yes, still a he) move the Church back to the center. That would, of course, be my hope, but I'm not being asked for my opinion. All I can say is this -- the Roman Catholic Church is in store for a most interesting Lenten journey. Last summer, I was hanging with some monks and one of the conversations last July was that Benedict was not healthy and had slowed down. Again in typical Catholic way, how they did not speak of Benedict was interesting. However, as the conversation went, the task of leading the church is huge. They recognized his humanity and the limits of the position. Perhaps, they knew that the Pope had to move them who are isolated at the very edge of the North American continent as well as St. Patricks in NYC. I think Institutionally the resignation will be transformtive, establishing a positive new pattern for succession, and allowing responsible popes a model of leadership change for many future generations. Like him or not Benedict's conservatism is less a reflection of one man than of the times. If he hadn't been elected then another conservative would have been. In an age where religious beliefs of all traditions are under political and intellectual attack from all sides, where post-modernist intellectualism questions not only the foundations of faith but the value of the institutional Christian church, it's not surprising that many Christian churches and in fact most faith traditions have responded with reactionary ultra-conservativism. And the conservatism is not just on the part of the visible leadership - from Muslim extremists to the Anglican laity in England with their decision to bar women from the highest office in that church, to the resurgence of Hindu fundamentalism we see the laity every bit as engaged as their leaders in the reactionary backlash against perceived attacks on their faith. When the institutions and their broad bases no longer feel under threat, only then can they begin to relax and allow beneficial change to happen. Until then any change, no matter how positive, will be perceived as potentially undermining. Don't expect a sea-change in the theology of the Catholic chrurch. Personally, I hope the Roman Catholic Church doesn't make a habit of having a pope resign. I like the fact that they are an ancient tradition. It is nice to have some communities remain the same. I'm assuming this was a personal decision by a person who realizes that the job takes a lot of energy that he no longer has. I also think he took into consideration what happened in the closing months, even years of JPII's reign. I don't think it will be a matter of the Church making this decision, but that of the Pope. I suspect you're right. I'm just hoping a new precedent isn't set. It is just a personal feeling. I won't lose any sleep over it. We have enough fish to fry!